Don't miss out the Green Friday 2018! not to buy anything all day, as an act against the capitalist consumption system we have, based on the principal of buying as many things as you can at the lowest price possible. only buy from responsible and sustainable brands who offer products that respect people and the environment. 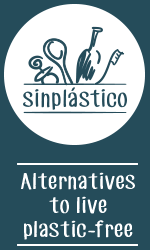 At Sinplastico.com we offer a 10%* off on all the products of the shop with the code : GREENFRIDAY. Take advantage and buy what you need from friday 11/23/18 until 11/30/2018. This Friday be part of the change, celebrate Green Friday! *Discount valid until 11/30/18, once per person, excluding shipping costs. May not be combined with other offers.